The North Avenue Baths building in the Wicker Park neighborhood dates back to the 1920s when, apparently, public baths and steam rooms were the place for big shots to do their wheeling and dealing. The building now houses a seafood-focused restaurant, where, surely, some wheeling and dealing occurs over business dinners. The monogrammed terracotta facade remains as a reminder of its origins. One of the Hubbard Street Murals in Chicago. I like older buildings. There's always some fancy trimming, to give it some personality, that you don't see on the new sleek glass and steel structures. And sometimes they have names, too. Someone was so confident that the business was going to be there forever that he/she had the name permanently applied to the building. This building is in the West Town neighborhood. I couldn't find anything about this particular business using my old standby Google. I did find some sort of archive-type document that made several references to Chicago and also stated that "Mr. M. Houlberg, who is a painter by profession, was elected president" of the Dania Society (which seems to be a Danish fellowship organization) in December, 1900. Perhaps the two were the same. It is also interesting (possibly ironic, though the correct usage of that word has confused me since the Alanis Morissette song) that the current business in this building is a salon of sorts. So M. Houlberg was right: the building is still in the painting and decorating business. Even when the leaves blow away, they leave a reminder. I'd not noticed this before! While I am glad this is not snow, it is something related: road salt. A huge pile of road salt. This one, in the East Side neighborhood, is probably one of many stashes around the city (Chicago does stockpile and can be a little selfish about its road salt). I'm glad we're prepared but I hope we don't need to use all of it! The corner of DeKoven and Jefferson, in the Near West Side Neighborhood, is the legendary site of the start of the Chicago Fire of 1871. The Chicago Fire Department Training Academy stands there, now, as well as a monument entitled Pillar of Fire. The sculpture was designed by Egon Weiner, an artist and former professor at the School of the Art Institute of Chicago, and completed in 1961. It was designated a Chicago Landmark in 1971. Logan Square has a small Firefighter's Memorial Park at the intersection of Diversey, Milwaukee, and Kimball. (Milwaukee is one of a few angle streets in Chicago that create six corner intersections where they cut through the "normal" grid pattern of streets.) It is dedicated to three firemen who were killed battling a fire in February, 1985. The centerpiece of the park is a large, colorful mural depicting three firefighters as angels. I found this statue in the Jefferson Park neighborhood. I took a few pictures of it with different settings on my camera. I zoomed in to get the detail of the little bird on the bag near the film slides (I've forgotten what they are called). Then I realized how easy I had it. I could take a bunch of pictures and just download them and delete the ones I didn't want - free and easy. But, in the "old days", this guy would have had to get the settings just right the first time because taking so many pictures and going through the whole development process would have been so very expensive. 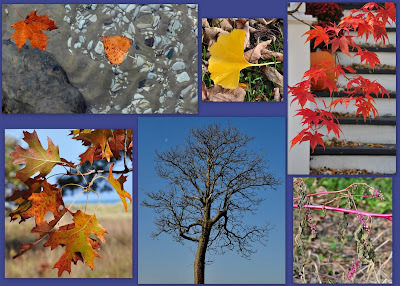 Today's photo is a collection of the colors of Autumn from various places around Chicago. The one non-Chicago photo is the large tree with the moon, which is from the other side of Lake Michigan. But if you could see across the lake, you could probably see the Chicago skyline from St. Joseph, Michigan. A beautiful Autumn day at the Osaka Garden in Jackson Park. Stumbled upon this school in the Lakeview neighborhood. The Nettlehorst School is named for Louis Nettlehorst, the Chicago School Board President from 1890 to 1892. This particular building was constructed in 1892 but it stands on the site of one of the first public schools in the Lakeview area. According to the website, there is quite a bit of art on the inside of the building. The outside grounds are quite artistic as well. The "Nettle Horse", an art piece constructed this year, seems to be made from scrap picture frame corners. The front doors are pretty enticing to walk through. And how about this big topiary dinosaur for a hall monitor? All of a sudden (due to the time change) it is dark enough to see the moon rise when it does so at 4:18pm. Native Americans kept track of the seasons by, among other things, giving names to the full moons. The November Full Moon is called the Beaver Moon because it signaled that it was time to set beaver traps before the swamps froze, to ensure a supply of warm winter furs. I'm not into furs so if I were naming moons this one would be called The Flannel Sheets Moon as it signals the time to change over to the warmer, cozier flannel sheets. This yard in the Lincoln Square neighborhood seems particularly bird friendly. The large tree in the center of the front yard has over two dozen bird houses hanging from its branches. First of the month means Theme Day on City Daily Photo. November's theme is Doorways. I have to admit I wasn't all that thrilled about the theme when it first won the voting. But then I found this doorway. And I had a complete change of heart. Suddenly "Doorways" as a theme was wonderful. I had a fun doorway I could use! But I didn't have my camera at the time. So I had to write down the address and go back to get this picture.